For a number of years now, the main theme of my paintings has been "the passage of time, and what remains". A large part of this theme has included the cycle of life. One symbol or metaphor in my paintings for the cycle of time has been bird nests. 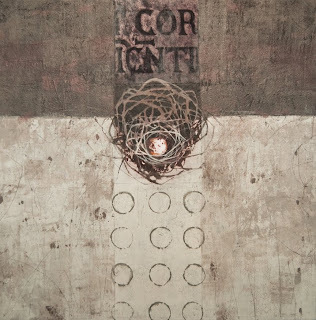 I am drawn to the lines in the nests of course, and the textures, and the usual round shapes which fits my love of textures, lines and circles. And the fact that birds, with such small brains, are hard wired to create such beautiful 'homes' for their offspring is a miracle of nature. But the main fascination for me, is the cycle of life... the renewal. 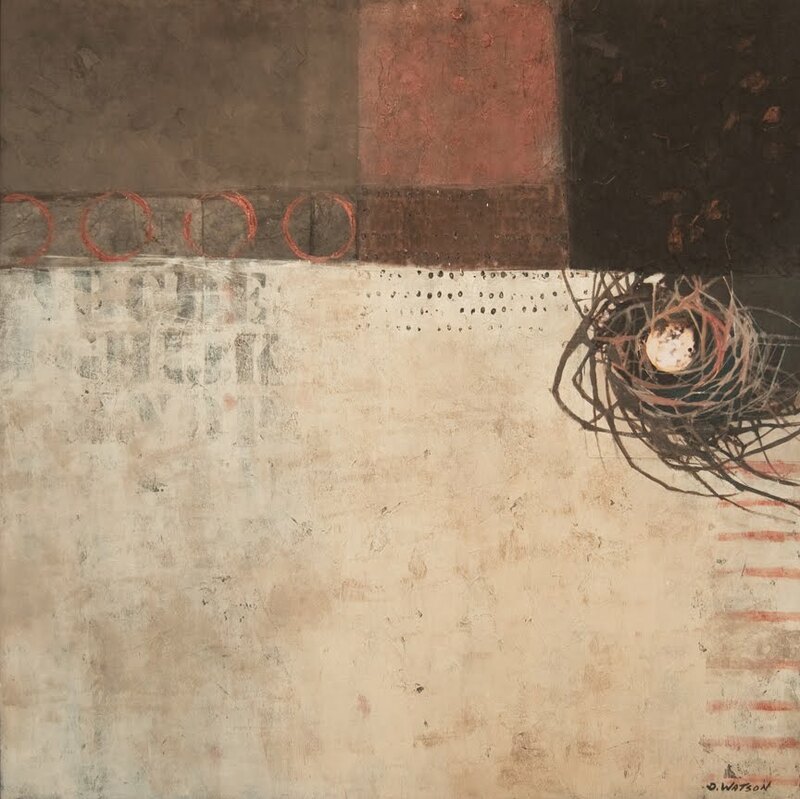 Nature's Gestures, 30" x 30"
For those who have been touched by the loss of a loved one... a partner, a family member, a friend... they know how hard it is to wake up to a new day, to find new meaning in life. I want to dedicate this posting to all those close to me who are facing their new life filled with change, with so much strength and hope. --- Healing in words, healing beyond words. There is a fresh poignancy about life each time we experience the passages of birth or loss. Our most tender feelings step over the barriers of day to day life and we see again how precious this one life is. Your love of nests resonates with me. We have a little bird nesting in the rhubarb in the garden. I check each day to see if the new ones are here. Once they are, the cats will be on restriction! Wishing all the best for those who feel the sting of loss. And P.S. Love your new works Donna! Histories is a particular favorite. 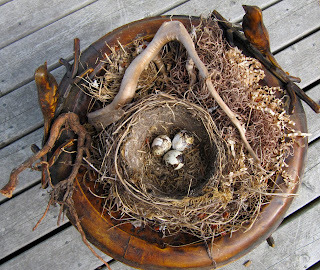 These nest pieces are so very beautiful, Donna. I find myself trying to look so closely that I feel like i'm falling into space. It's your layers. The work is so simple and pure, yet complex and rich. Like life. These pieces are gorgeous! I didn't realize you worked so large. I'd love to see them in person. It's fun to see things in context to get a real sense of size. Maybe you can post a few pix from the Salem show?? Love the Anne Hillman quote. This is life in the human realm, isn't it, experiencing this sense of loss? We will all go through it at one point or another. Wishing ease and comfort to those going through difficult times. I love your new paintings, colors are very calming. I could watch them for hours, everything is in balance. Thank you for your last post I have looking for if can bye from web INNER EXCAVATION-book, it seems to bee full of inspiration. Beautiful works Donna, and beautifully married to the philosophical thoughts of the authors. This post was particularly beautiful for me at this time in my life, when just last week we experienced the birth of a new granddaughter. The cycle of life is so pure, so true. It brings to mind all the nurturing, caring, and love that must come from within. If only we could stay that young, that vulnerable forever. We would never want to hurt or be hurt again. And, coincidentally (or not since I don't believe there are any accidents in life) my word verification was: nestingi Isn't that amazing??? I love nests too, the depth of life they hold. I love nests lines going in million directions, all magnificently intertwined, individually yet connectedly, and interconnected to the lines of trees. Beautiful words and images Donna. I am always very enthusiastic. Your works combine nature, modern design and elegance quite outstanding. Beautiful set of pieces. I wish they were on the wall opposite me here, as I'd like to just sit with them and return to look again. Your new works are wonderful in those lovely earthy colours and your text and quotes will require reading several more times yet. Thank you. Beautiful imagery and motif using the birds nest. I love the theme and spirit of 'renewal'. Your work is stunning. Bird's nests are a particular favorite of mine as well. You might want to check out the amazing new book by Sharon Beals. It's entitled "50 Nests and the Birds that Built Them." The photographs are quite beautiful and may provide some additional inspiration for you. donna, I always have to look at your new post one evening then come back in the morning and look again to see what I missed the first time! what a lovely set of pictures! and after our "japanese orphan " conversation what a perfect dedication. Thank you for sharing your work! Very, very beautiful! It is said, "It is one thing man can not do, build a bird's nest." Did you know "she" shapes it with her breast? Thank you for this post. You are a woman that can build a bird's nest. It's been way too long since I've last visited your blog- but so glad I have today. Your words in parallel to your paintings are just beautiful. Just love the sentiment that a smile is the shortest distance between two people. I'm going to try to remember that always! Beautiful work-the colors, the feel and the understanding and coming to terms of life's cycle. Thank you! your post gave me a smile and touched my heart--the words, harmony of your work, the colors seem esp. muted, quiet, evocative of rusts in the Histories esp touches a chord. Watched a small cardinal press her breast into the making of a small almost funnel nest outside a glass door this spring. She seemed to shape it enough for her body expanded by her heart and breath. We do the same with the love around us, and it stretches out, crosses the boundary of time and space. I still see (from your phrase above) the smile of my brother who left a year and half back, and its as if he is here and his small boyish hand could reach across the space of a breath and pass me again a small feathered nest found by him in the woodlands where we played. Renewal, yes, its like another, personal Spring with rhythms of its own soul in each thing. 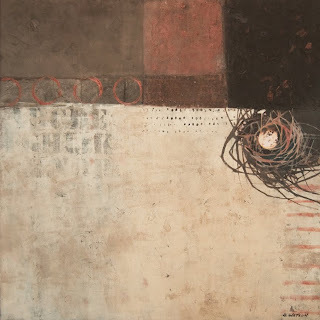 Love your beautiful new work Donna, especially Renewal! The months of May and June are full of anniversaries for me so this post has come at the right time. A comfort...Thank you. "Keep the channel open. No artist is ever pleased. There is no satisfaction whatever at any time. There is only a queer, divine satisfaction, A blessed unrest that keeps us marching And makes us more alive than the others." So meaningful to me and I shall be referring to them often! leaves me hopeful that life, which is change, which is full and includes loss, eases each beloved one's pain ... and artists' words and images help the renewal of spirit. Thank you for collecting these thoughts together in your "nest" of a post. The wish to be 'held' in a time of loss is such a strong one--and often we do not find that holding from the people around us. Your work and words provide that container so many of us need. I love the way in which you speak about the small brain of birds in relationship to the beauty of their nests! I'll be looking at my resident mocking birds in a whole new way! 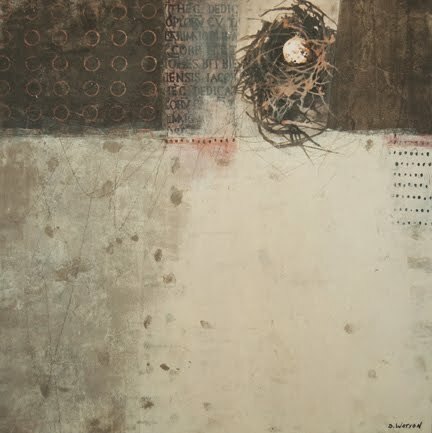 Wonderful how you incorporate the nests into your work. I always marvel at your composition...fabulous! Your artwork here is sensational. There is something about all your pieces that truly speaks to me. And this post, and the meaning behind it, is especially meaningful to me! Donna - I have to second precisely what Seth said above. I hope you continue this particular approach - to my eye - some of your most expressive and meaningful work! so beautiful Donna...your work and the wonderful quotes and thoughts of your own you have so lovingly gathered into a sweet, safe nest of a post. beautiful work, so gentle. I will collect the nest soon to enjoy, but I almost can't bear that they build a new one each time, renewal indeed, & such acceptance. Your work is so beautifully nuanced . . like nature's history. 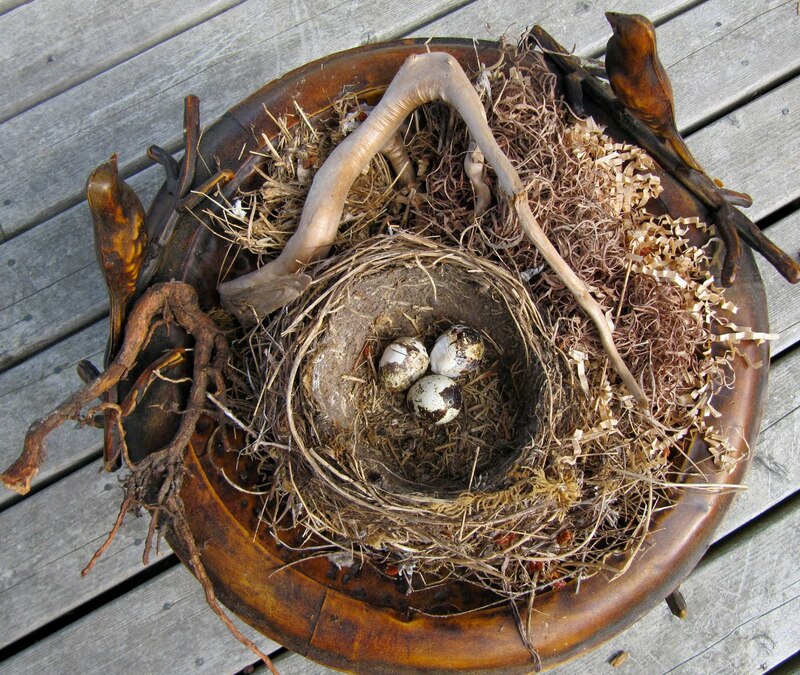 These nests, and the nest that is our heart that holds and encircles our loves, very moving Donna. I am sending you peace and quietness north across the pacific and sound to you in your beautiful nest and hopes that it holds you tight in its arms. So quietly moving and beautiful. Thanks. Yes, the smiles, laughter and laughter is one of the best systems of healing.